Note: This article contains an in-depth analysis of one scene of the film Battle Royale. As such, spoiler alert. If you want to watch Battle Royale, you can find it on Amazon Video to rent and buy here. Battle Royale is an intriguing film about a class of Japanese students who are sent to an island and forced by the government to murder each other until only one remains. Many extend comparisons between this film and the popular Western Hunger Games franchise. I guess, wherever you are in the world, you can find movies about kids killing each other entertaining. The most fascinating part of Battle Royale for me is the first few hours of the homicidal game, where students scatter, buddy up, and make rash decisions about how to proceed given their circumstances. Some people choose to embrace the game for their own survival. Others become strangely consumed with bloodlust. Some try to run and hide. Others decide that the only option is to shun the game and rid themselves of its pain through suicide. This last thing is what I’m most interested in. Suicide is a morally muddy question mark. Camus claimed it to be the only real question of philosophy. On the opposite side of the philosophical spectrum, certain religious doctrines deem it to be a sinful act. Historically, Christianity held the belief that suicide is a sin, although now it is more up for debate. Looking at it from both sides, we can use Battle Royale‘s more suicidal characters to analyze a unique situation. Assuming the historical Christian tenant of a sinful suicide, it is hard to pinpoint the morality of these characters’ actions. At the onset of the Battle Royale, four characters commit suicide. The first two claim to be doing it in order to protest participation in the game, with one character tossing her weapon off a cliff before the pair jump off themselves. From here on out, I’m going to refer to this couple’s action as a moral suicide. The moral suicide proves to complicate the notion of a sinful suicide. My understanding of the Christian tenants behind suicide are not particularly strong, but I know there are arguments about suicide being akin to murder or that suicide makes it impossible to repent for ones sins. Either way, committing suicide in order to avoid killing others seems like trading one sin for another. The lesser of two evils. Then again, why not remain in the game and not kill anyone, saving your own soul without harming another. Seems morally righteous enough, right? But in a way, this complicates the situation even further. Remaining in the game as fodder for another player to kill only allows another person to be sinful. By remaining alive and perpetuating the game, one more murder must take place for the atrocity to be over. Certainly one can’t be blamed for sins committed upon them by another, but suicide would show having the moral foresight to prevent more sinning by removing oneself from the sinful environment. In short, suicide acts as a form of martyrdom in Battle Royale. An early sect of Christians known as the Donatists held the belief that suicide was a form of martyrdom, but this sect was deemed heretical by the Church. In the end, the two characters pitching themselves off the cliff at the opening of the game are a religious question mark. They commit a moral suicide in that they prevent further sinning by eliminating their bodies, but the uncertain philosophy of suicide in the Church makes their ultimate fates uncertain as a result, regardless of the morality seen in their actions. Of course, we can also look at this suicide through the lens of absurdism. Camus claimed that our very lives are based on meaninglessness, that we search fruitlessly for meaning when we should just embrace the fact that we have none. Sisyphus rolls the boulder up the hill only to have it roll back down to the bottom, where work must be started anew. But Sisyphus must be looked at as a happy man, as it is the work itself that gives the guise of meaning in an act that is inherently meaningless. The Battle Royale is like Sisyphus and the boulder. The students’ very existence is put into question as they meaninglessly execute one another. It is a metaphor for life itself: devoid of purpose, largely directionless, at times grotesque. 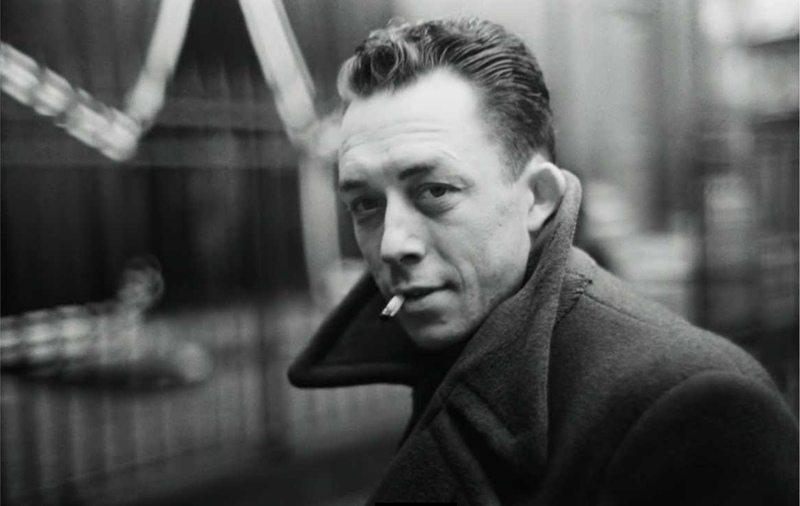 The question then returns to Camus: “The only true philosophical question is suicide.” Camus would say that suicide is not the solution to absurdism. Sisyphus is a happy figure despite the absurdity. In A Happy Death, Camus tells the tale of a man searching for happiness in a world where superficial things like money dictate who can be happy. In doing so, the man dies a happy death, and it is the indifference with which he sees the world at the end that allows him that death. So suicide is not the happy death. Nor is it the way out of Battle Royale, as Camus would tell you. What would absurdism dictate you do in the Battle Royale, then, I hear you ask? Well the answer is simple. Just take part! If Battle Royale is the life given to you, then it is the life you are to live. Searching for anything beyond would be futile, just as us searching for anything beyond the lives we’ve been given would be futile. In both A Happy Death and The Stranger, the disillusioned protagonist kills a man with little thought to the consequences. In one, the protagonist takes money from the dead man in order to reach for the happy existence he strives for. In the other, the protagonist is sent to jail and condemned for not “playing the game” as Camus put it. In both cases, the killing itself is meaningless, but it is the inciting incident that leads both characters toward understanding the absurdity of existence. In short, play the game. It’s what Camus would have wanted. Battle Royale is a fun movie (if you can stomach extreme violence), and I wrote this article to have a little fun with one scene that I found interesting. Sure, I have only superficial knowledge of Christianity, and only slightly more knowledge about Camus, but I don’t aim for anyone to view this as an academic work. Just, you know, don’t think about it too much. I definitely consider suicide as a sin no matter what the situation or circumstance. It’s essentially the easy way out of a tough situation as you don’t need to deal with the consequences anymore. I feel like the characters are just trying to justify their decision by saying that this way they won’t be participating in the game, but then they’re just leaving everyone else to fend for themselves. The best thing to do here is definitely to keep on playing and ideally take down as many opponents as possible without killing them, just taking them out of action. There are many ways to injure someone without going all the way. Of course, everything said above is a lot easier to say when you’re safe at home than in a warzone. There are a lot of super tough situations where it can be tempting to commit suicide, but it’s mainly tempting because it is a sin. As for the film in question, super violence is certainly not a genre that I like and I don’t care for films where normal people turn against each other for just about no reason so I’ll take a pass on this one, but good analysis.